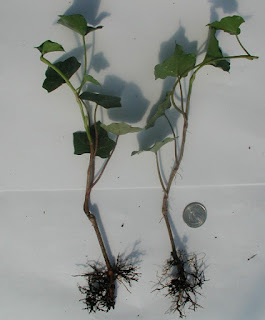 GoGardenNow - The Gardening Blog: How should I take care of bare root plants until I plant them? How should I take care of bare root plants until I plant them? Q. If I buy bare root plants from you, how should I take care of them until I plant them? How soon must they be planted? A. You will receive your bare root plants from us in bundles wrapped with moist packing medium. When you receive your package, open it. Set the bundles upright in the box. Retain moist packing material around the roots. Avoid exposing the plants to sun, wind and freezing temperatures. Do not let the roots dry. If you can’t get around to planting very soon, place the bundles upright in moist potting soil. Cover the roots with soil. Water well. Keep the roots moist until planting time. Plant sooner than later. Never let the roots dry.